To comply with fire and safety regulations a commercial property is advised to have an emergency lighting system. On complete failure of your lighting system the emergency lighting can reduce the risk of injury and even fatalities in an emergency situation. Able Electric excel in electrical lighting so when you’re in need of an emergency lighting system you can trust one of our electrical experts to install your escape lighting system with minimal fuss. 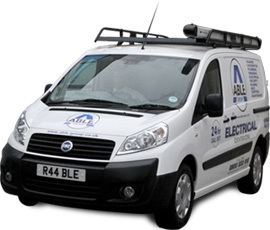 With no call out charge we give you the peace of mind that any installation or repair work will only cost you from the moment our trained electricians arrive at your property.